The world's most performed playwright was born in April 1564 in Stratford - upon Avon about two miles North West of London. The actual day is not recorded, but according to the records of Stratford's Holy Trinity Church, he was baptized on April 26. 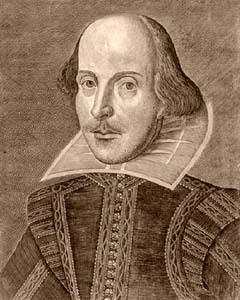 As it was customary to baptize infants within days of their birth, and because Shakespeare died 52 years later, on April 23, it has become traditional to call April 23 his birthday. Shakespeare attended the local Grammar School but he had no university education. In 1582 he married Anne Hathaway, eight years his senior. The couple had a doughter, Susanna, in May 1583. Two years later Anne Hathaway bore Shakespeare twins, Hamnet and Judith. His son, Hamnet, died in 1596. It is unknown how Shakespeare became involved with the stage in London. He became a famous playwright and was a leading member of the Lord Chamberlain's company, which became the King's Men on the accession of James I in 1603. Shakespeare was not only a playwright and actor; he was also one of the owners of the company. Until he retired to Stratford he was with this remarkably stable company. Hamlet, Macbeth, Othello, Romeo and Juliet, As You Like It, Midsummer Nights Dream, The Tempest and Winter's Tale are only some of his plays. Heinrich von Kleist was born on 18th October 1777 in Frankfurt(Oder). His father died when Heinrich was 10 years old. In June 1792 he entered the Guard regiment in Potsdam and was promoted to lieutenant in 1797. However, he devised an antipathy against the Army and took his resignation 2 years later. He studied some semesters at the Viadrina University and began to work as a volontary in Berlin. Heinrich von Kleist dealt with the philosopher Immanuel Kant (1724 - 1804) and he was deeply impressed by the spirit of Enlightenment. This affected Kleist's life. Kleist restlessly travelled through Germany, France and Switzerland. He was steadily tormented by longing for death. 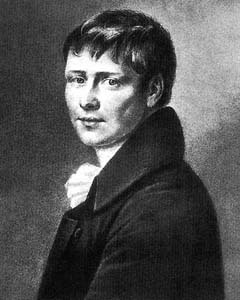 Heinrich von Kleist was an eminent playwright and novelist. The conflict between the individual person and whose duty, to regiment into general public, took centre stage of his literature. Heinrich von Kleist was increasingly lonely. He had no hope and he saw no outlook in his life. During this time he got to know with Henriette Vogel (1777-1811), who suffered from cancer. She consented to die with him. They committed suicide by shooting themselfes. It happened on the waterfront of the lake "Wannsee" near Potsdam on 21st November 1811. "The Broken Jug" and the "Kathy of Heilbronn" are the most known works of him. He is one of the greatest English writers. Charles Dickens was born on 7 February 1812 in Portsea, Portsmouth. He was the second of eight children. His father was a government clerk. He did not earn much money and the family could not pay their bills. Therefore he had to go to prison with his family. Charles did not need to go. He had to work in a factory very hard, many hours each day. He never forgot about his life at the factory. Charles attended for two years Wellington House Academy. At the age of 15 he left school and became a solicitor's clerk. Later he became a reporter of parliamentary debates. Charles he had learned shorthand and in this way he could write his reports very fast. In 1836 he married Catherine Hogardt, the daughter of a newspaper editor. He had 10 children with her. His first novel "Pickwick Papers" made him very popular. 1837 he wrote "Oliver Twist" and other novels. In 1843 he was inspired to write "A Christmas Carol". In 1850 was published his novel "David Copperfield". In this book he wrote about all he had suffered as a child. His marriage broke down in 1858. 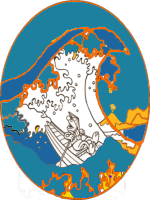 Dickens began to travel through England, Scotland and Wales. He gave a lot of public readings of his work. But his health began to suffer. He undertook a tour to USA and this tour damaged his health severely. 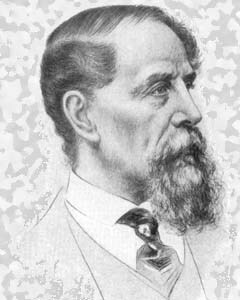 Charles Dickens died from a stroke on 9 of June 1870.